In my childhood home, on the top shelf of the cupboard just to the left of the stove you could always find several blue and white boxes of Jiffy Corn Muffin mix. Actually, it’s a good bet that my mom has a couple boxes stashed away in there now. 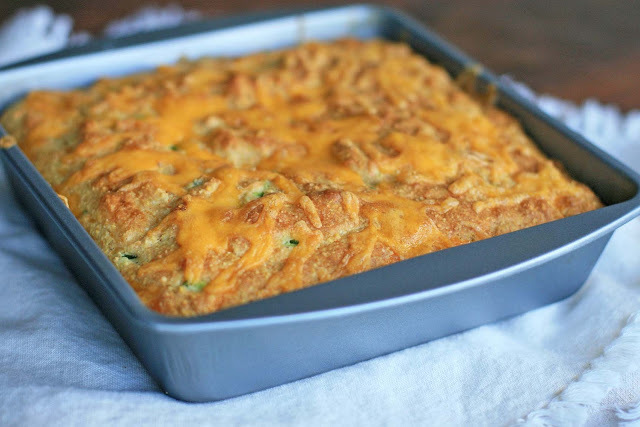 It wasn’t until college when a roommate told me that she always added in drained, canned corn that it even occurred to me that you could spruce up cornbread. Clearly, any sort of culinary creativity I now possess is a recent development. Looking for even more of an upgrade? 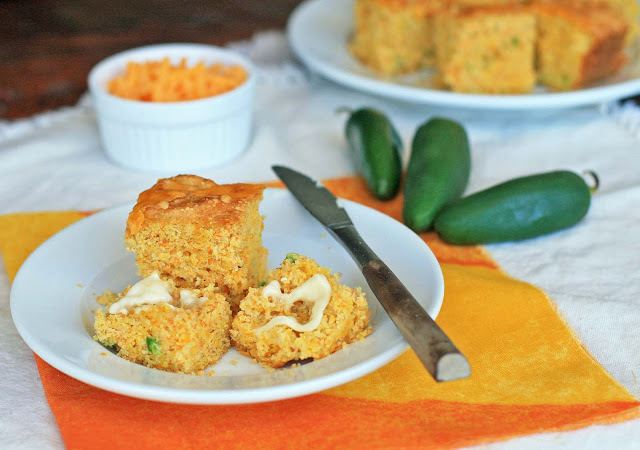 How about taking things up a notch or two and making some cheesy, spicy Jalapeno cheddar cornbread? Any leftover bread is just fine at room temperature, but heat it a bit in the oven or microwave to really let it shine. The incorporated cheese will melt and keep things super moist. If you’re a glutton like me, spread it with a hefty pat of butter. Yum. One Jalapeno gives the bread a good, medium-level heat. If you want some real fire, up the number of Jalapenos or use a hotter pepper. Or if you prefer things mild, use only half a Jalapeno. Preheat oven to 400 degrees and grease a 9-inch by 9-inch pan. 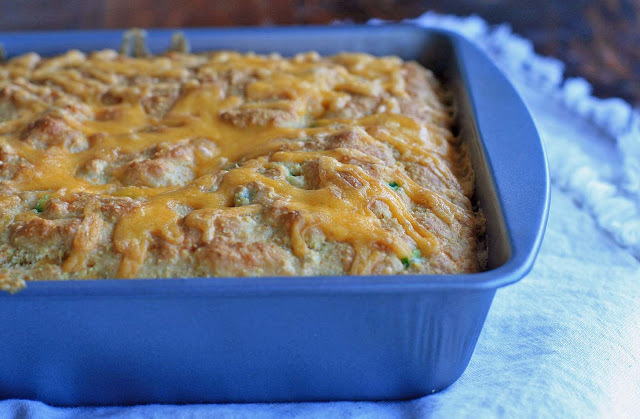 In a large bowl, combine the cornmeal, rice flour, sorghum flour, potato starch, xanthan gum, sugar, baking powder, baking soda, salt, and 1 cup of the cheddar cheese. Pour the melted butter on top of the mixture.Add the buttermilk and eggs and stir to combine. Mix in the minced Jalapenos. Bake in the preheated oven until the top begins to turn golden brown and a toothpick inserted in the center comes out clean, about 20 minutes. Remove the bread from the oven and sprinkle with the reserved cheddar. Return to oven and bake for a couple additional minutes, until the cheese is melted. Let cool slightly before cutting into squares. Serve warm.